Too many people reach adulthood without a clue about money. Very quickly they find themselves in confusion and with some debt. This happens, most often when there is little or no foundation in money education. Do you know how much money your parents earned when you were a kid? Most of us don’t. Do you know who made the financial decisions and who balanced the books? Which parent was a spender and which was a saver? Were you aware of friction between your parents about money? Did your parents come at money with an attitude of abundance or fear, jealousy or generosity? Many of us got to adulthood and wondered why we weren’t better prepared. We handle money as we perceive our parents did but we have no real knowledge of what they did and did not think, feel or do about spending, saving or giving money away. Money matters and you can parent with intention on this subject. And you can start today. Recent research shows that today’s youth have large sums of money floating through their hands as extra income to be spent on snacks, clothing, and cars. A 2007 study sponsored by the U.S. Department of Labor found that 40% of children receive regular allowances or handouts from their parents or guardians averaging $60+ per week. Sixty dollars a week is a hefty sum of money, but youth today have plenty ofopportunity to spend it – on everything from comic books to movie tickets to video games. And marketers are taking advantage of children’s deep pockets-by age twenty, as the average child will have seen 360,000 thirty-second commercials. With so many influences on children’s perceptions about acquiring material goods, it is critical that parents teach their children sound money-management skills. Those children of the computer generation need to know online banking and record-keeping skills. The sooner they learn that a debit card is not a magic card, the better! 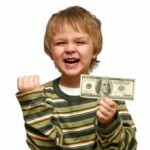 Experts recommend several ways parents can teach their children about money and foster positive attitudes and habits. They suggest parents use everyday opportunities like grocery shopping, paying bills, and withdrawing cash from the ATM to teach their children. This teaching can begin as early as age three, or whenever the child begins asking about money. Experts also instruct parents to tailor their teaching to their children’s age, maturity, and level of understanding. 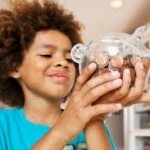 The following ideas are ways parents can teach their children about money. Talk about how you earn money and how you plan to spend it. When you take your child to the grocery store, explain your purchasing decisions: “We are buying strawberries because they are on sale,” or “We’re using coupons I clipped from the newspaper.” Kids who don’t know the value of a dollar are apt to lose money and use money up quickly, just like adults. If he’s still living at home, I promise it is not too late. And if she’s already asking for candy and toys at the store, it’s not too early, either. The best time to start giving your children money is when they will no longer eat it. Basically, when they don’t put it in their mouths, they can start putting it in their bank. 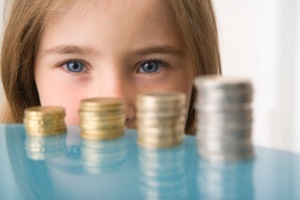 Your children will develop their financial attitudes and behaviors by what they see you do, not what they hear you say. Actively encourage good values. Teach your children the value of work and teach them responsibility. Teach them delayed gratification by letting them save towards a goal of a new bike or video game; let them know that even you have things you want and cannot have. They will not necessarily intuit this. Even if you are able to buy your child everything he or she asks for, refrain from being overindulgent. By fulfilling every whim, you may deny your child of several things: appreciating things that cannot be bought; being motivated to work hard; persevering through obstacles and frustration; and achieving a hard-won goal. Learn to say no to your child and be firm and follow through. It’s a gift only a parent can give. Children should help around the house without being “bribed,” but they’re going to ask for pocket money anyway, so why not kill two birds with one stone? (Or maybe, get a bargain at a two for one sale!) This can be covered by a weekly allowance contingent on chore completion. You could count allowance for “communal” chores, such as doing dishes, cleaning the bathroom or taking out the garbage – but don’t pay out for picking up after playtime or keeping the bedroom together. If your kids want to do “extras,” like washing the car or folding the laundry, maybe pop for a few “extra” dollars. Of course, intrinsic motivation is important. If children are intrinsically or naturally motivated to do something (reading, math, crafts, sports, etc.) because it brings pleasure or allows them to spend special time with you or a grandparent or a sibling, there is no need to offer monetary rewards. Even when a child is initially hesitant, the need to offer money or material prizes may diminish over time when the task reveals its intrinsic value. It’s pretty touchy, but if you try to use these opportunities to grow your child’s money vocabulary, you will both be gaining a good deal. Every Saturday the kids get an allowance based on their age, i.e. Roarke gets $7 and Lennox gets $5. They each split their allowance into three categories. 1. “Spend Money” – 1/3 of the allowance is to spend. They can use that money immediately to buy whatever they want within parental guidelines. Generally, Lennox buys Jr. Mints or a Peppermint Patty if they go to Target. Roarke likes little cars, Trading cards or Lego’s. They don’t use it every week. 2. “Save Money” – 1/3 goes to save for bigger ticket items. If Lennox wants an art kit she saves her money to buy it. If Roarke wants the Big Star Wars Lego set he saves for it. This concept takes time to learn because most children are interested in immediate gratification. Basically, every couple of months the family goes to the toy store with their save money and the kids buy something more expensive. Also, if they’re going to the Science Museum, both kids are allowed to take some of their save money to buy what they want because the educational value of this merchandise is important to the family. They can spend on gifts: Mother’s Day both kids pooled their saved money and bought mom slippers. They can spend on charity: During Thanksgiving week, the kids each took money from Save and went to the grocery store and they bought cans of food to donate. It was moving for the parents and the children to see them each hand over their money to pay for the cans, then put them in the barrel to donate. 3. “Invest money” – 1/3 goes to invest. This includes an explanation about money growing, doubling and tripling if not spent. 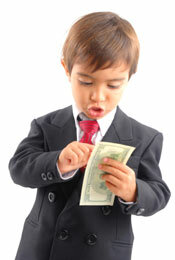 As children grow, they can get an education about stocks, CDs, bonds, and so forth. Every 3-6 months the family takes out this money with the kids and helps them invest it. Some parents add to the Invest section so the children see the investment grow. So, for example, Roarke might want to buy a share or so of Lego stock and Lennox might buy stock in Tootsie roll industries because they make Jr. Mints. So Roarke puts $2 in both Spend and Save, and $3 in Invest. This kit has curbed the begging for a toy every time the family goes out. It also makes it special when mom and dad say they’ll buy the kids something outside of birthdays and holidays. And, it’s great to see them with their wallets at the cash register. It also helps them to understand how much things cost. For example, Roarke wrote a story and said that some people who invented a machine got a lot of money, $50. His parents asked him how long it would take him to earn $50 at $7/week. When he realized it would only take him a couple of months and that grown ups get a lot more than that, he changed the amount in his story to $5000. From the piggy bank to the bank account. First, each month, put money into a mutual fund or savings account for the kids. Let them know that this is a responsible action you are doing for them to support your family value of getting a college education and investing now to be financially prepared when the time comes. When they are ready, maybe when they have reached a special savings goal, it may be time to help them open their very own savings account. This will be a big step that they can be proud of and it can help them take ownership of their financial future. Spending their own money on something that a parent would not spend money on is an option, but still requires parental approval. For example, your daughter can spend her own $20 on a music CD that you are not willing to spend that much money on, but she may not buy it if you think the lyrics are inappropriate – no matter whose money it is. Birthday and holiday gifts should not be contingent upon whether or not chores are done. As children grow they should be encouraged to notice the time, effort and expense that go into these celebrations, and to show appropriate gratitude for that. After all, it is the parents’ responsibility to help children learn the meaning of the much passed phrase from generation to generation “that money does not grow on trees.” I think it is appropriate to make family decisions to go on a special winter vacation like to Disney land and forgo gifts that year. Remind your children that memories last longer than material things. Help your child experience the good feelings of sharing his or her income with others. Encourage your child to regularly contribute a portion of his or her income to a charity or help your child buy treats for the family. “Adopt” a family through your religious organization or school during the winter holidays. Also, teach your child to contribute in ways other than giving money by giving time, energy, and skills to help someone else. Children should make gifts, if possible. This emphasizes the family value of creativity and self-expression. It is appropriate to encourage them to spend a minimal amount of money on special art materials with which to make gifts for family and friends if the materials are not already in the home art closet. On occasion they may want to help buy an important store bought gift. That is fine, just so long as they know it is not necessary. For their dad’s birthday Roarke and Lennox both pitched in $5 from their own money and the mother put in the rest to buy the saw that their father wanted very badly. The children did all of the work wrapping it and making a card, and that was that. Some families expect children to pay for friends birthday party gifts, some expect kids to pay half and most parents buy those gifts for the birthday child so their child has a gift in hand to take to every birthday party they are invited to. In my opinion, it’s unrealistic for adults to expect store-bought gifts from children, but siblings might be encouraged (as they age) to select and purchase appropriate gifts for their siblings birthdays. This is a good lesson in reading the desires of another and meeting that desire without thinking of your own needs in that moment. Involve children in preparing a grocery list, and then take them to the store with you. Teach them how to compare prices by making a game out of finding the best deals. Have the children hold the coupons, and let them hand the money to the cashier. Sticking to your original list will also demonstrate one way to limit impulse shopping. Help teenagers who are earning money create and follow a budget. This is especially important before they leave for college, where they will have significant financial responsibility. Emphasize the freedom that comes when they plan their spending and saving. Don’t be afraid to cut or curtail money giving to your kids if they are abusing the privilege or making irresponsible choices. Board games or computer programs. Play money-related board games or computer programs with your children. We all played Monopoly but did we ever have discussions about real estate and the benefits of investing as we were growing up. Without ruining the game, the occasional instructional conversation can leave a lasting impression. When it comes to planning vacations, most children assume they can go wherever the rich kids in their class are going. When your 8-year-old whines that she is tired of driving holidays and wants to go to Europe and Hawaii like all the other kids it is worth a conversation about how different vacations come with different price tags. Invite the children to help plan the family vacation. Involve them in the decision-making process for all aspects of the trip, such as food, travel, hotel, souvenirs, activities, etc. One family I know decided to forgo individual Christmas gifts and instead put all that money towards a family trip to Disney world. It was a memorable, worthwhile tradeoff that brought with it good financial training as well. Have high-school students pay the family bills for one month (with the parents’ money and over sight, of course). Use play money to recreate bill paying for younger kids. With this play money, help them to see what you have, what you need to pay, and what will be left over for your discretionary spending. I am not advocating burdening your children with financial stress but educating them so family decision-making around finances is more comprehensible. Real banking, compound interest and credit cards. When your child is mature enough, help them open a checking and savings account and teach them how to balance a checkbook. Teach your children the benefits and penalties of compounding interest. The Harrington’s taught their children that they could earn interest by matching their savings 25 cents on the dollar. Once their 16-year-old son got a job, the Levy family added $10 to every $100 their hard working teen kept in the bank for over a year. $700 became $770 with the parents help and that didn’t even account for the true interest the bank added. This was a powerful incentive for the teen to save. While sharing the benefits of compound interest make sure to also teach them the drawbacks of paying interest when they borrow or purchase on credit. Warn them that credit card companies send many credit card offers to college students and to beware of such temptation. If your teenager is financially mature enough to apply for a credit card while they are still at home, find one that allows you to set the spending limit and view the monthly statement on line so you can be up to date on the credit status and are aware of your child’s purchases, if need be. Review the monthly statements with your child and teach them the importance of paying the balance each month. Help children learn about the ups and downs of the stock market early in life. Then they will most likely be more comfortable with investing when they are adults. Give gifts of stock in child oriented companies your children are familiar with to encourage them to follow the stock market. Taxes are a significant expense that few children consider. Have your child sign his or her tax return. If your child is employed, look at his or her pay-stub together and discuss how taxes work and why they are necessary. When I was a child I helped my father organize receipts by the month for taxes on his business. I was paid a penny a receipt if it was accurately done. This allowed me to see all the work that was involved in paying taxes and also helped me develop a focused work ethic. So discuss money! It is more than polite, it is vital. Within a family, it is a good idea to discuss money! Teach them your healthy life lessons about money when every day circumstances arise. Explain that the family finances is not something discussed casually with peers or strangers. Teach them that borrowing and lending money to friends adds to the complexity of friendships. Make it clear that you cannot buy friends when your 13 year old is insisting on giving too extravagant a heart shaped necklace to his 7th grade heart throb on valentine’s day. Use your actions and words to convey your values. When your child hits you up for $20 to go to the mall, invite them to work a few hours for that $20 and the mall spending will be more appreciated. “Money doesn’t grow on trees” is as relevant a message today as it was when your grandparents said it to your parents and when your parents said it to you!